A supermarket chain in Denmark has withdrawn from sale sandals with the images of Jesus Christ and the Virgin Mary on them after criticism from religious groups. The sandals, which come in child and adult sizes, feature images of the two holy figures on the upper sole along with a blue or pink background. Despite selling more than 4,000 pairs, Coop Danmark, the company that owns the Kvickly chain selling the sandals, decided to withdraw them after receiving more than 200 complaints. "It was never our intention to offend people's beliefs, but apparently that was the case, and we were surprised by the scale of these protests," spokesman Jens Juul Nielsen said. Protesters at a Kvickly shop in Aarhus, about 125 miles (200 km) north-west of the country's capital, Copenhagen, destroyed several pairs of the sandals only hours after they went on sale. 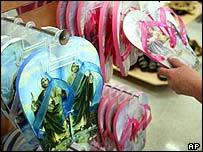 A local Catholic priest filed charges against the store for blasphemy. "We Catholics pray to Jesus and Mary and now they want us to walk all over them," Johannes Gram Kulis told French news agency AFP. "That's blasphemy and a serious and indecent violation of the religious sentiments of believers." Although around 84% of Danes belong to the Lutheran Church, statistics say that less than 5% attend church regularly. Less than one per cent of Danes belong to the Catholic Church, the Associated Press news agency said.